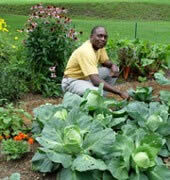 See Your Site featured on the extremely popular VeggieGardeningTips.com gardening website! Our site has a strong following and very loyal reader base. And of course custom arrangements – special ad placements, etc. Get a text link ACROSS THE ENTIRE SITE in a prime spot above the fold! Your site will be Featured at the top left navigation bar, above the fold, for all our readers to see – for all our readers to see! This means exposure on over 600 content pages and growing daily! A text link on VeggieGardeningTips.com costs $150 per month, or just $97 per month for 3 months paid in advance. That’s MORE than a full month free! Advertisers are also featured in a monthly post encouraging our readers to support our sponsors. Secure your spot today with PayPal and see your site featured in 24 hours! Hurry, only 5 spots left. Get started today. We’ll review your site, product, or service, and post the review to our blog. You’ll get excellent exposure to our reader base, as well as great Search Engine value because of your new incoming in-text links from VeggieGardeningTips.com. Click here to secure your review now with PayPal – and see it published in 3 days or less! A sponsored review on VeggieGardeningTips.com costs $197. Note: we look forward to working with you, but our readers are always our first priority. Only reviews which are relevant and would be of interest to our audience will be accepted. Also, our reviews are always honest and positive, so we will not accept reviews for products or services that we cannot speak positively about. Questions? Email us with your inquiry to kenny.point@gmail.com. Looking for a custom partnership? Email us and let’s get started. We’ll work with you to come up with a great deal for everyone involved. Email us with your inquiry to kenny.point@gmail.com.